f(x) (vocalized by saying the two letters; sometimes pronounced as "Effects") is a South Korean girl group created by SM Entertainment. Known for their experimental style the band released four full length albums and had one concert tour in 2016 called "Dimension 4 – Docking Station". They are one of the few internationally recognized K-Pop bands while becoming the first K-Pop act to perform at SXSW and being on Fuse’s list of '41 Best Albums of 2013' with "Pink Tape" as the only K-Pop artist. The band made their official debut at Music Core on September 5, 2009 with their single "LA chA TA", promoted as "girl group with a concept that has never been done before with a dynamic feel". f(x) is composed of Victoria (Song Qian; 宋茜), Amber (Liu Amber; 刘逸云), Luna (Park Sunyoung; 박선영) and Krystal (Jung Krystal, the younger sister of Jessica; 정크리스탈). They debuted with member Sulli (Choi Jinri; 최진리) who went on hiatus in 2014 in the middle of the promotions of "Red Light" and eventually left the band one year later to focus on acting. Therefore, the other members promoted their last album in 2015 as four. On March 18, 2017 Luna announced through her YouTube channel that f(x) is preparing for a comeback later the year. The band's name results from the hypothesis that every mathematical function f(x) changes each time based on the different x's just like the band's style which will vary each comeback to show their unique talents and various charms or alternative: x has different values based on the equation which is put in. The x stands for each member who will show different results of work. The other meaning, initially promoted by SM Entertainment, explains that the f represents "flower" while the x signifies the female's double x chromosome in conclusion meaning flower girls. Seven years after their debut the band got their official fandom name: "MeU" (미유). Along with the literal meaning of "me" and "you" implying f(x)'s love for their fans and conversely, it also refers to the mathematical "mu" (μ), relating to the group's name. The name was announced in early 2016 at a solo concert and left the fans upset. First, they fought seven years to get a name (EXO-Ls, fans of EXO who are also signed to SM Entertainment, were named in 2014, two years after their debut) and then they got a name which translates to "breasts" and is also the name of a condom brand . The furious fans who were angry ever since the debut of f(x) because of the lack of promotion and interest SM Entertainment gives to f(x) (besides experimental styles which cause more determination to appeal the masses) complained rather getting called "Aff(x)tion" after the self-named international fan forum. Nowadays, the fans came to terms with the name. The fandom colour was much earlier introduced (kind of unofficial): "Pearl Light Periwinkle". Fanfiction includes femslash among the f(x) members (Krystal x Amber is huge) and with fellow girl groups from their own Entertainment as well as not such as SNSD. Het pairings often include boyband members from groups like Super Junior and SHINee since they are also from the same label and had previous interactions. But Victoria for example is also increasingly paired with 2PM's "Thai prince", Nichkhun, as they were a "couple" on the popular variety program "We Got Married". As previous mentioned fans often complained about bad promotions or rather negligence of the entertainment as well as the band being underrated because of that and their unique style. It's an open secret that the band isn't as supported as sister and brother groups (like SNSD or EXO) as well as being forced to promote an experimental style. Fans get enraged. 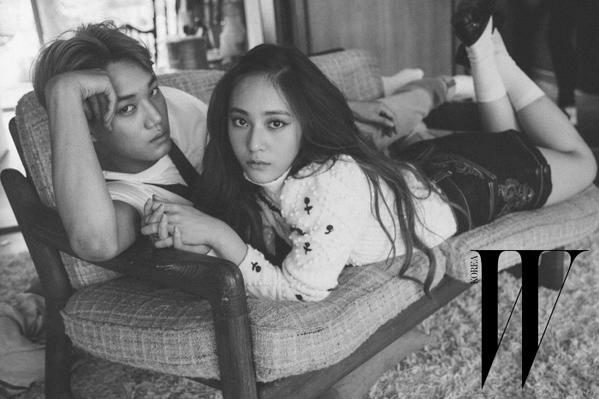 Kai and Krystal confirmed their relationship on April 1, 2016. The two visuals shared the same dream and since they are from the same label the grew close. After a long friendship they started dating. Sasaengs revealed then the "backstory of Kaistal" which isn't taken seriously by most fans. The relationship divided the fandoms. While some said that they looked good together and are super cute since they wore many couple items (many fans also looked fondly at the couple since they both kept their relationship out of media in consideration of fans), others claimed that the couple simply was fake and "one of SM's stunts", maybe to cover something bigger up. These fans never believed in the relationship and felt vindicated when the couple broke up 14 months later . On May 31, 2017 SM Entertainment simply stated "It's true that they've decided to part ways." . The reason for the break up was their busy schedule (earlier it was also stated that they grew distant) which is after the hating fans the typical excuse. According to their statements they wanted to remain "good friends" like before. This page was last modified on 20 September 2017, at 02:59.